“Forming Disciples for Mission” Develop an understanding of what makes evangelizing parishes and consider practical ways to evangelize in parish life. “Forming Leaders for Mission” & “Understanding the Collaborative Model for Mission” Support all in the parish community in discerning and developing personal calls to lead within the individual, family, community, parish, and collaborative lives. The evening includes a mixture of group activities, individual reflection, prayer and conversation. Of all the Lenten devotions, Stations and Benediction are the most deeply rooted in what Lent is about. 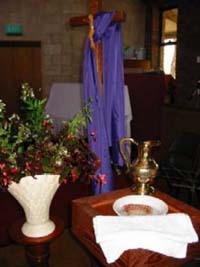 Each Friday of Lent walk the “Via Dolorosa” with Our Lord and worship Him at the foot of the Cross as his Blessed. Join our parish community along with 13,000 Other Catholic Communities in the United States! In a life changing Lenten journey with CRS rice bowls and kids. Please pick up your family rice bowl in the back of the church if your child does not bring one home over the next few weeks. Remember your Lenten sacrifice changes lives. To assist St. Athanasius parish families in the practice of almsgiving during this Lenten season we are encouraging all to participate in our LENTEN GOSPEL GIVING. EACH WEEKEND, members of the parish (old, young, and in-between) are asked to bring one item (to whichever Mass they attend) as suggested by the readings of the day and indicated below. There will also be a Lenten Gospel Giving reminder each week’s Bulletin. Bar Soap, Body Wash, Bounce Sheets, Chap Stick, Roll-on Deodorant, Q-Tips, disposable razors. Room Fresheners, Shampoo, Conditioner, Sun block, Tooth-brush, Toothpaste, Handy-wipes, moisturizer, wet-naps, band-aids, shaving cream, mouthwash, baby wipes, tooth picks, dental floss, nail files, odor eaters, feminine hygiene products, hand sanitizers, insect repellant. (Hotel sized miniatures of toilet-ries are great.) Tylenol, eye Drops, Foot Powder, aspirin, Rolaids, Pepto Bismol, Tums, Imodium AD, Cortisone cream, Motrin, Vitamin C Chews etc. "The young man saw the light and changed his life!" "Embrace Your Call to Holiness!"